DETROIT -- About 375 laid-off workers at a General Motors Co. small-car plant in Michigan must transfer to the Lordstown Assembly Plant in Ohio next month or risk losing all supplemental unemployment benefits. The transfer is part of a landmark deal with the UAW that reduces wages at the Michigan plant so that GM can cut production costs enough to build small cars profitably in the United States. The workers offered the transfer earned full pay, or $28 an hour, before the Orion Township assembly plant north of Detroit was closed last November to retool for the new 2012 Chevrolet Aveo subcompact, due next year. 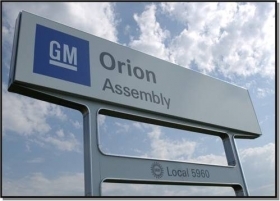 But no room remains for them at Orion Township today because a new cost-saving UAW agreement with GM requires that 40 percent of Orion's hourly work force receive so-called Tier 2 or entry-level wages of $14 an hour. So Orion needs just 800 of the 1,175 fully paid workers on layoff, with the remaining, lower-seniority workers offered a transfer to Lordstown or its accompanying stamping plant, said Orion Township workers who attended an informational meeting yesterday at the union hall of UAW Local 5960, which represents Orion Township workers. Lordstown is running three shifts producing the Chevrolet Cruze compact. Orion Township, when it reopens next year, is slated to build the Buick Verano compact in addition to the Aveo. Orion is expected to open with about 800 workers recalled from layoff at $28 per hour and about 400-plus entry-level workers earning $14 an hour. The pay excludes benefits. Nick Waun, an Iraq war veteran who hired in at Orion Township in 2005, said that if he doesn't take the offer by today, he'll lose all supplemental benefits that, when combined with unemployment, pay him about 70 percent of his regular wages while he's laid off. Waun said he also would have to apply soon for an extension in unemployment because he's been on layoff since the plant closed in November. Leaving will be a chore: He's currently enrolled at the University of Michigan-Flint, where he is in his junior year majoring in economics. Waun said he received a letter informing him of the transfer opportunity Oct. 13. But he said he's still in a better position to move than many of his co-workers at Orion Township. Waun said the transfer on such short notice would cause dislocation and grief for many families -- who will have to decide whether to move, split up or decline the transfer and hope something will open at Orion Township at least a year in the future. “This is going to tear families apart,” he said. GM says the cost savings at Orion Township will allow the company to build the Aveo and the Verano profitably. Local 5960 shop chairman Mike Dunn, who presided over the informational meeting, declined to comment. The transfer program to Lordstown seemingly rules out any practical prospect that any legacy workers will return to Orion Township at reduced wages when the plant reopens next year. They'll have no opportunity for recall to Orion until at least 2012, said a UAW source. And they would have to go without unemployment and supplemental benefits for at least a year while they are waiting for a chance to be recalled. Until the UAW agreed to end the Jobs Bank at GM, Ford and Chrysler early last year, laid-off workers could receive 70 percent of pay and full benefits indefinitely until a job opened within a 50-mile radius of their plant. Now, if workers reject a transfer within a multistate region, they lose their supplemental pay and benefits. The UAW source said GM is offering $30,000 for the Orion workers to transfer to Lordstown if they agree to stay there at least three years and $4,800 to workers who agree to stay six months, the source said. The workers who take the $30,000 incentive would have no right to transfer back to Orion Township. UAW Local 5960 has scheduled another meeting today at Orion for retirement-eligible workers. That program would allow workers with at least 29 years of service to stay on layoff until October 2011, when they could retire with full benefits, the source said.